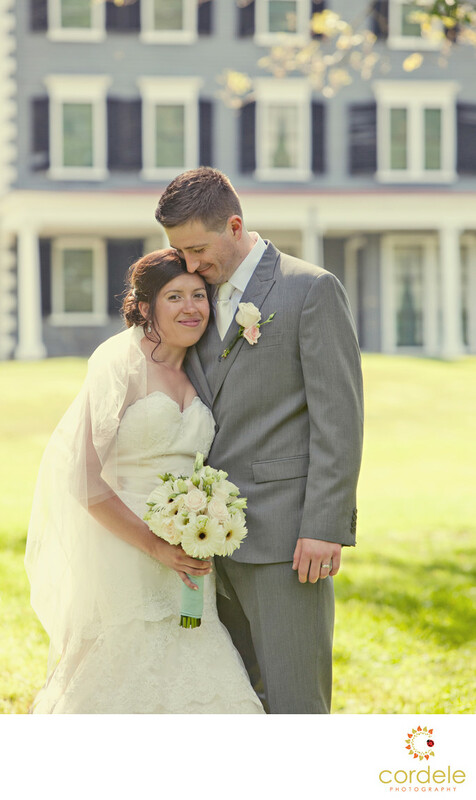 A bride and groom pose in front of the Codman Estate after their wedding. The estate is located in Lincoln MA and has wonderful grounds for photos. In this photos, the sun is behind them and the bride is holding white daisy flowers in her boutique. The groom is dressed in a gray suit and snuggles up to the bride to have a moment. The Codman Estate requires you bring in a caterer and music and provides you with the name of a couple tent companies. When having events here, most people use the big field to offer their guests field games and some even put out couches to give it a unique feel. The Estate is located just south of Route 2 and is part of the Codman. The Carriage hosue is where the actual weddings are help, but you are allowed to use the Codman's actual house for photos.